OH-OH (noon update): On good authority, heavier bass losses blown up on dike. I need a second request for a wet winter…. MID MORNING UPDATE: While the numbers sound scary, it’s just not so. I went out to take photos and I couldn’t find enough dead fish to fill the lens. The boys cleaned her up fast. Just remember, this is a lake that has 10,000 baitfish per surface acre. The make-up of the larger fish number is a question I have, but since bass are only about 10 percent of the total, anyway, don’t expect those losses to be very high. Not a happy sight, but we call it like we see it. And so does the city that had this photo and related information to my desk early this morning. A combination of hot weather, day and night, led to a fishkill dominated by shad, but which included some larger fish as well. “A significant fish die-off occurred yesterday morning. I estimate the Lake lost about two (2) large fish per surface acre and 2-3% of the Threadfin Shad (baitfish) population. Lake-wide these losses equate to about 6,000 large fish and 500,000 Shad. 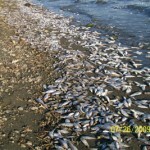 “The fish died from low oxygen levels, most likely a result of a series of hot days and warm nights. Warm water holds less oxygen, than cool water. Another contributing factor could have been a higher concentration of phytoplankton (algae) this summer, caused by a lower lake level and increased nutrient recycling. This algae bloom may have crashed (died) and caused a temporary increase in the biological oxygen demand, which lowered the dissolved oxygen in the water. So what does it all mean. Pretty much the same thing for all of SoCal. We hope El Nino is not going to be a tease this winter. This entry was posted on Monday, July 27th, 2009 at 7:16 am	and is filed under News. You can follow any responses to this entry through the RSS 2.0 feed. You can leave a response, or trackback from your own site. I said last Thursday lake was getting green. I blame the city water has not been pumping in and the aerators have not been on–it’s sad. They put a lot into the lake and are letting it slip by not keeping it up. Maybe now they will. Hey Edward, no long faces. The reclaimed water coming in is almost a push with evaporation. Can’t expect that to change anything between now and October. But you are right, the aerators, which operate on auto when conditions meet previously determined parameters, need to run 24/7, not just one out of every three hours the rest of the summer. Still, it’s about total water volume versus nutrients that preclude most oxygen depletion. The records show that when the lake gets near an elevation of 1240, what we’re seeing not that unusual. What’s it at now, 1241 and change? I would say Mother Nature is going to have her way the rest of the year and there is little we will be able to do about it. No, no long faces it’s just sad, but I did get a 12-lb. cat last sat. Hope the wipers survive. Wow sorry to hear, the lake was just getting very healthy again, the bass bite was getting good.